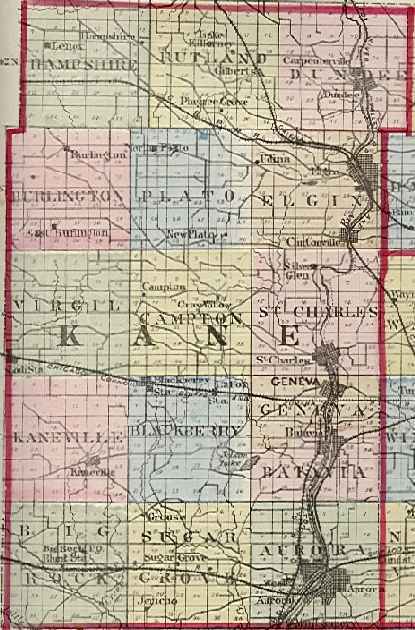 Kane County was organized on January 16, 1836. It was named after Territorial Judge Elias Kent Kane. The new Kane County included DeKalb County and part of northern of Kendall County. 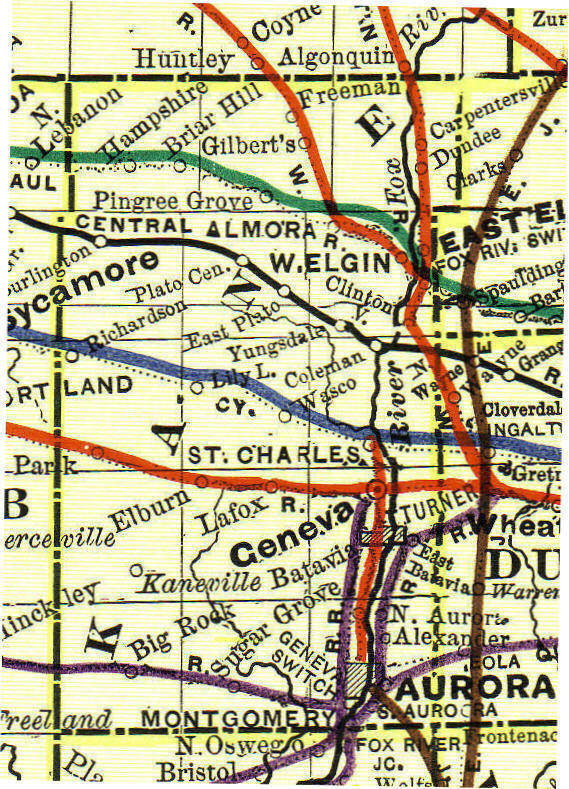 DeKalb separated from Kane County in 1837, and Kendall in 1841. Some of the earliest settlers were Joseph and Samuel McCarty, Hezekiah and James T. Gifford, and Christopher Payne. Read about early Kane County life - click here for access. I am Pat Sabin, County Coordinator for Kane County ILGenWeb . I have been an active contributor to The USGenWeb Project since 1996, and a County Coordinator since 1999. I also host the DuPage County ILGenWeb. Your volunteer participation is welcome! Read more ABOUT the USGenWeb Project and ILGenWeb Project, and visit the VOLUNTEER page to see how you can contribute. My interest in Kane County is through my New England families who migrated to Northeast Illinois from 1833 to 1850, settling in Cook, DuPage, Iroquois, Kane, McHenry, and Will Counties. Please be patient while I update this site. Thanks to Marcia Holpuch, for her dedicated service as Kane County ILGenWeb Coordinator, 1998-2007, and to all the contributors who made this site such a great resource for Kane County genealogists. The USGenWeb Project is an all volunteer organization. I regret that I do not live in Kane County, and may be unable to help with personal research questions. However, I hope we have included ample information here to assist you in your search. *NOTE: These are OLD QUERIES, and you may find that some email addresses are no longer valid. We continue to make these accessible in case an old post offers a missing puzzle piece! Also in Batavia, visit the Gustafson Research Center at the Depot Museum where they have a card file index of the Batavia Herald. I am gradually moving June's info to the ILGenWeb site. Thank you for being my good friend and sharing your info with Kane County ILGenWeb! This link (outside of ILGenWeb) will show you how the counties changed through the years and census divisions for federal census years. Illinois Census and County Formation Maps . Janet Pearson has copied township maps from atlases from different years. As they become available, they will be added to the list. To see a map of a particular township, click on the year within that township. These maps can be exciting sources for research as they show the property owners at the time the map was compiled - between census years. Sources: 1872 - Combination Atlas Map of Kane County Illinois. Compiled, Drawn and Published from personal Examinations and Surveys by Thompson and Everts, Geneva, Illinois, 1872. See the title page from this atlas. These maps were scanned and contributed by Janet Pearson. 1875 Map of Kane County showing all Townships Donated by Alice Gless from the Atlas of Henry Co. IL to Which is Added an Atlas of the United States" by Warner & Beers Publishers, Chicago. 1892 - Atlas of Kane County Illinois. Drawn and Compiled from Personal Observations, Actual Surveys and County Records. D. W. Ensign & Co. 1892 See the title page from this atlas. County "overview" maps showing the townships and section numbers can be viewed for the north and south portions of the county. This set of maps have been scanned and donated by Janet Pearson. 1892 Railroads - This is a single map of the County showing the railroad lines from the Twenty-First Annual Report of the Railroad and Warehouse Commission of Illinois, 1892 scanned and donated by Deb Haines. Imagine if all those railroads were still functional today... do you see a different traffic pattern?? 1904 - 20th Century Atlas of Kane County Illinois, Containing maps of Villages, Cities and Townships of the County. Middle-West Publishing Co. 633-634 Manhattan Building, Chicago, ILL. 1904. See the title page from this atlas. This set of maps were scanned and donated by Janet Pearson. Please put "Kane County" in your subject line.